X-Small - $19.99 Only 1 left! Small - $14.99 Only 4 left! Wookies get a bad wrap. A Wookie rips a guys arms off in a fit of rage one time, and that's all anyone will talk about for years. Han sure never lets it drop. Chewbacca isn't one to just rip some arms off. Maybe he choke holds Lando, but to be fair Lando had imprisoned him. And he doesn’t kill him, or even permanently maim him. Chewy is the most stylin' guy in the whole series. Every image of him is basically a glamour photo. He is likely to put runway models out of business. Every strand of beautiful brown hair is perfectly in place on his sizable head. And even when his hair is wind swept on Hoth, he looks beautiful. Kate Moss doesn’t even look that good. With looks that good he can't possibly be the mindless brute type. If you are looking for a way to show off your geeky beauty queen side, then this Star Wars Chewbacca Skater Dress if the one for you. You can be as glamorous as Chewbacca. We wonder how many times a day he has to brush his hair...all of his hair, to keep it so perfect and silky smooth. 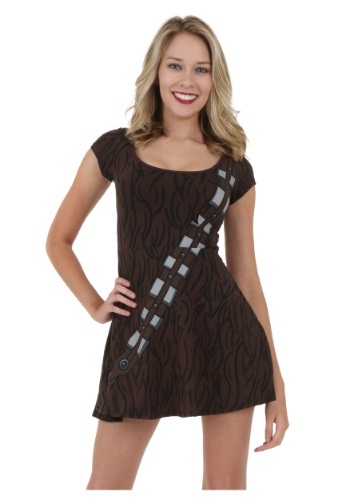 Fear not though, you wont have to brush any more than normal while wearing this stylish Chewy dress. You can be the proof that Wookies aren't mindless brutes like some people would have you believe. And the next time someone *cough*Han*cough*, talks about Wookies ripping peoples arms off, just give them a hug and remind him that he has arms too.